Neighbours who for years didn’t know each other, even though they lived next door, get to know the people in their vicinity, greet each other on the street – and help each other out. According to the Italian press, it is “a little miracle ” that is taking place in Bologna and in about 60 other Italian cities. 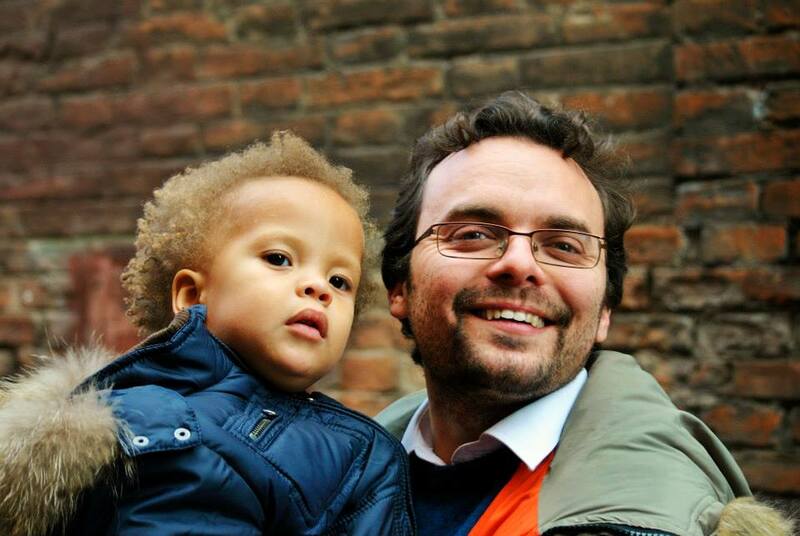 Federico Bastiani (37) walked with his nearly two-year-old son Matteo and his wife Laurell under the red arcades of Via Fondazza in Bologna last summer when an idea struck him. “Matteo has always played alone until then and I was wondering if there might be other families with young kids in the neighbourhood,” says Bastiani. Federico with his son Matteo who made him create Italy’s first social street. But not only the children of the Via Fondazza can now play together, the residents greet each other again and even stop in the street to ask how the other is doing. “We are experiencing a very different atmosphere in Via Fondazza. Many are once again aware that they are part of a small community”, says Bastiani. Someone is looking for a backyard to put their bike… the response comes quickly. 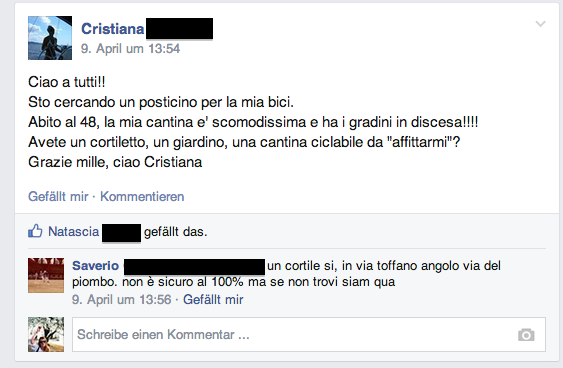 Since founding the group in August 2013 some residents of the Via Fondazza wrote a post almost every day. A young girl wants to give away her dresser, in another post someone is looking for a cat-sitter and someone to pour the flowers over the holidays, another one is looking for advice on where to find a good plumber or a doctor. “This kind of information is usually hard to find. But on Facebook everything happens very quickly. Someone responds mostly within a few minutes”, says Bastiani. And for those who do not have Internet or a Facebook account? Even older and not Internet-savvy residents are not being left outside. If a larger event is organized such as common hiking, going to the movies or reading, then Bastiani and his numerous helpers print out flyers that are laid out in the small shops of Via Fondazza. The shopkeepers try to draw the attention to these events when they meet older people who do not have Internet access, tells Bastiani. The 63-years-old Luigi Nardacchione has been involved in the Social Street adventure since the beginning, and has helped organizing many events. Among other things, he organized the photo exhibition “I volti di Fondazza” ( ` The faces of Fondazza ‘ ) for which the inhabitants of the street were photographed. “The nicest thing for me is that I have helped to transfer the virtual world of Social Street into the real world of Via Fondazza and the people are saying hi again to each other and do more together”, said Nardacchione. Most members of the group are between 20 and 50 years old, including many students, reported Bastiani. But even some interested people from other cities have joined the network. The Bologna group has now more than 700 members. Only a few weeks after the foundation, the Italian media picked up the topic and reported about Italy’s first Social Street and referred to them as ” little miracle“. 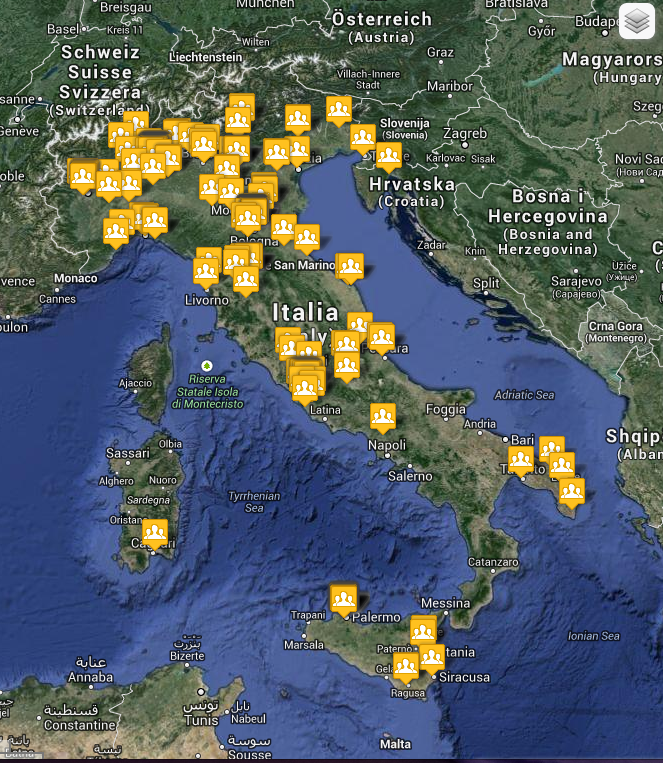 More than 60 Social Streets have been founded in Italy. Imitators were quickly found. In more than 60 Italian cities there are now Social Streets, which Bastiani all collects on the official website – including streets in Rimini, Milan, Rome and Pescara. “Also in Portugal, Croatia and even in Chile, we know of Social Streets. Sometimes I also write with people who want to start a Social Street and ask me for advice”, says Bastiani . The concept fits into a time in which many people, not only in Italy, are financially bad off and they move closer together, helping each other out. Nardacchione says: “People have recognized that there is not only economic but also social poverty. The financial situation often does not lie in the hands of an individual, but the social does.” Socialising is for free and that is why it is so valuable, he adds.